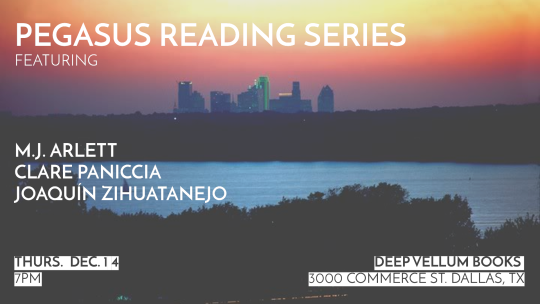 Hosted by Courtney Marie and Sebastian Paramo, Pegasus Reading Series was founded in 2014 by Robert Torres and Sebastian Paramo. Now independently run by working artists, our aim is to bring together writers from the Southwest and beyond. M. J. Arlett was born in the UK, spent several years in Spain, and now lives in Texas where she is pursuing her PhD. She is a founding editor at the Plath Poetry Project and former nonfiction editor for Gulf Stream Magazine.